“You cannot win a war against the Houthis from the air – you need to send ground forces in, but now there's a program to train tribal fighters on the border,” a Doha-based military source familiar with the matter told Reuters. According to another Yemeni official source, some 300 fighters have already managed to return to Yemen after getting Saudi training. They were allegedly send the Sirwah district in the central Marib province to battle Houthis in the area. According to the source the newly trained unit managed to push the rebels back. Saudi Arabia’s coalition spokesman failed to either confirm or deny the reports. “We always confirm that we are helping the resistance and the popular groups, the loyal army ... but we cannot go into details on where, how, how much,”Brigadier Ahmed Asseri said. The training received by the Yemeni tribesmen in Saudi Arabia allegedly includes light weapons and tactical advice knowledge. According to another Reuters source, the Kingdom plans to boost deployment of such units to fight the Houthis resistance. Rhiayad is reportedly gathering all tribal leaders loyal to the ousted president Abd-Rabbu Mansour Hadi, who fled to Saudi Arabia, to unite their tribal forces against those of the Houthis. “Saudi Arabia wants to unite tribal leaders in this meeting but the feeling is that there's not much hope for that,” a Yemeni source in Riyadh told Reuters. Apparently the tribal delegations seem more concerned battling the jihadi elements in Yemen in addition to the Houthi opposition. “The Saudis have decided that they are going to intensify the unstable situation by providing arms to an oppositional group, a group that has been traditionally oppositional to the Houthis,” Ajamu Baraka, Middle East expert told RT. On the ground in Yemen, the Shiite Houthi fighting force and army units loyal to former president Ali Abdullah Saleh are in control of central and southern areas. The fighting is ongoing on a number of major fronts. 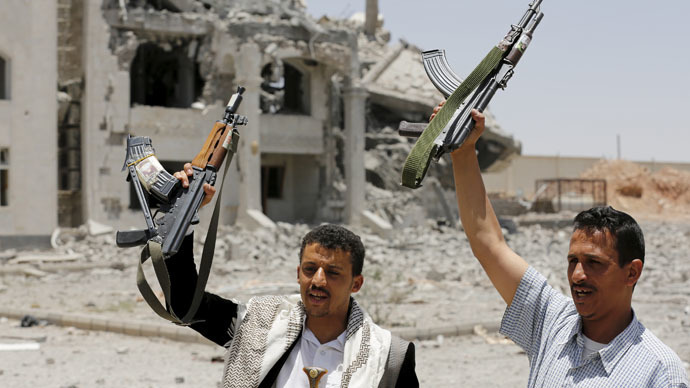 In Aden, the Houthis are engaging tribesmen who are supported by Saudi-led air forces. In Yemen’s third largest city, Taiz, Houthis are fighting the Sunni Islamist fighters. The Houthis and their allies have been also fighting both Islamists and local tribesman in Marib and in Shabwa provinces. “The only force that is gaining as a consequence of this conflict is in fact Al-Qaeda,” he went on to stress. Meanwhile, the airstrikes continued throughout the country on Wednesday, targeting Houthi forces in Aden, Saada, Hajja, Taiz, Ibb and Bayda. The fighting in Yemen continues despite all sides of the conflict being willing to hold peace talks. “The Saudis have an objective which is connected to the interest of Israel which is basically to perpetuate the narrative that Houthis are the proxy force of Iran,” Baraka said, adding that such policy also suits Washington.